Grand Central Publishing, 9781455592388, 368pp. From the New York Times bestselling author of You Should Have Known and Admission, a twisty new novel about a college president, a baffling student protest, and some of the most hot-button issues on today's college campuses. Naomi Roth is the first female president of Webster College, a once conservative school now known for producing fired-up, progressive graduates. So Naomi isn't surprised or unduly alarmed when Webster students begin the fall semester with an outdoor encampment around "The Stump"-a traditional campus gathering place for generations of student activists-to protest a popular professor's denial of tenure. A former student radical herself, Naomi admires the protestors' passion, especially when her own daughter, Hannah, joins their ranks. 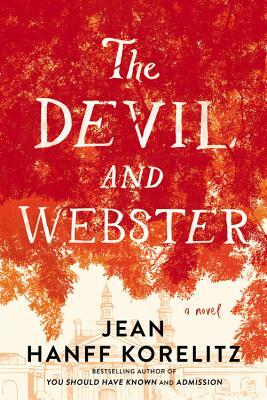 Then Omar Khayal, a charismatic Palestinian student with a devastating personal history, emerges as the group's leader, and the demonstration begins to consume Naomi's life, destabilizing Webster College from the inside out. As the crisis slips beyond her control, Naomi must take increasingly desperate measures to protect her friends, colleagues, and family from an unknowable adversary. Touching on some of the most topical and controversial concerns at the heart of our society, this riveting novel examines the fragility that lies behind who we think we are-and what we think we believe. Jean Hanff Korelitz was born and raised in New York and graduated from Dartmouth College and Clare College, Cambridge. She is the New York Times bestselling author of five novels and the creator of BOOKTHEWRITER, a New York City based service that sends authors to book groups. In 2016 she and her husband (Irish poet and The New Yorker poetry editor Paul Muldoon) adapted and co-produced "The Dead, 1904", an immersive adaptation of James Joyce's "The Dead", for New York's Irish Repertory Theatre. "Satisfying...A sharp and insightful novel....with a clever plot twist...This ought to be the start of a golden age for the campus novel."